Share the post "Common Questions About Fibroids"
Uterine fibroids are benign growths that develop in the wall of the uterus. These growths affect roughly three out of four women, according to the Mayo Clinic. While these growths do not always cause symptoms, several treatment options are available for women who do experience discomfort or other complications. The following questions about fibroids are ones that are commonly asked. The underlying cause of fibroids isn’t known, but researchers believe that hormones and genetics might increase the risk of developing these growths. Women who are thought to be at higher risk include those with a family history of fibroids, those who begin menstruation early and those who consume a high amount of red meat. Hormones can also affect fibroid growth. The production of estrogen and progesterone can increase fibroid growth, while a decrease in these hormones can cause them to shrink. 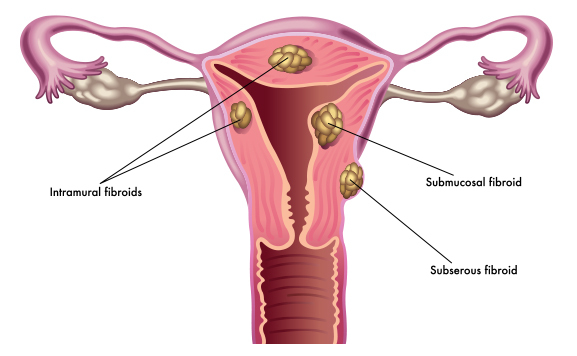 Fibroids are mostly benign or non-cancerous. According to the Office on Women’s Health, the chance of having a cancerous fibroid is lower than one in 1,000 and the presence of benign fibroids does not lead to a higher risk of developing a cancerous fibroid. Fibroids usually don’t cause health issues, although they can cause pain in some cases or result in anemia from blood loss. For women who want to conceive, it’s important to note that fibroids can interfere with implantation in some cases. Women with fibroids who become pregnant might also have problems, such as a breech baby or preterm delivery. 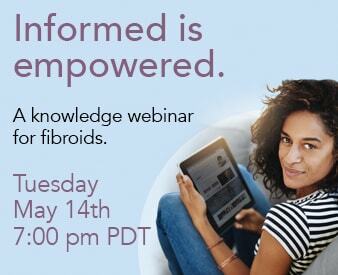 The exact symptoms and the severity of these symptoms depends on where fibroids are located, how large they are, and how many are present. Fibroids inside the uterus’ inner cavity can cause menstruation problems and difficulty conceiving, while those outside of the uterus can cause bladder problems or lower back pain. Fibroids that develop inside the uterine wall can lead to heavy menstrual bleeding, as well as a feeling of pressure. What Types of Fibroid Treatment Options Are There? Medications such as gonadotropin-releasing hormone agonists or a progestin-releasing intrauterine device help regulate hormones that affect fibroids. This can relieve symptoms, although they do not get rid of fibroids. This minimally invasive procedure involves placing a catheter with embolic agents inside the arteries connected to the uterus. These agents block the flow of blood to fibroids, which causes them to shrink. This procedure offers a permanent way to get rid of uterine fibroids, but it is considered major surgery. It is not intended for women who wish to conceive, and there are certain risks associated with it, such as excessive bleeding and infection. Robotic or laparoscopic myomectomy is another minimally invasive option for removing fibroids while leaving the uterus in place. While this procedure can be done for women who wish to conceive, fibroids can end up coming back. If you would like more fibroids information, including treatment options, please contact The Fibroid Treatment Collective.